Hmm. Interesting that they are "moving" Pilgrims Plunge to the water park. I kind if like the new name. Does anyone know if the new slide complex is going to go near it? This water park needs to take a page from Cowabunga Bay and add shade. Edit, just reread the announcement and noticed the "misters and shade". Last edited by Moose on Tue Oct 23, 2012 6:48 am. Saw the markers this past weekend but didn't think it would be a waterpark expansion going there, great looking slides! Plus a new entrance for Splashin Safari, I wonder where that will be? Halloween weekends was great so I'm glad they are adding more weekends, lighter crowds and it was a much better experience for my daughter compared to last year at Kings Island since she still is not tall enough to ride all the coasters there and is a little scared of the monsters that walk around. I'm interested to see what this means for future theme park expansion and going in that direction of the park, considering the attractions that were hinted at for '14,'15, and '16. Last edited by CoasterWeasel on Tue Oct 23, 2012 7:25 am. Holiday World has sent us their official press release announcing the details of their $6.5 million in investments for 2013. 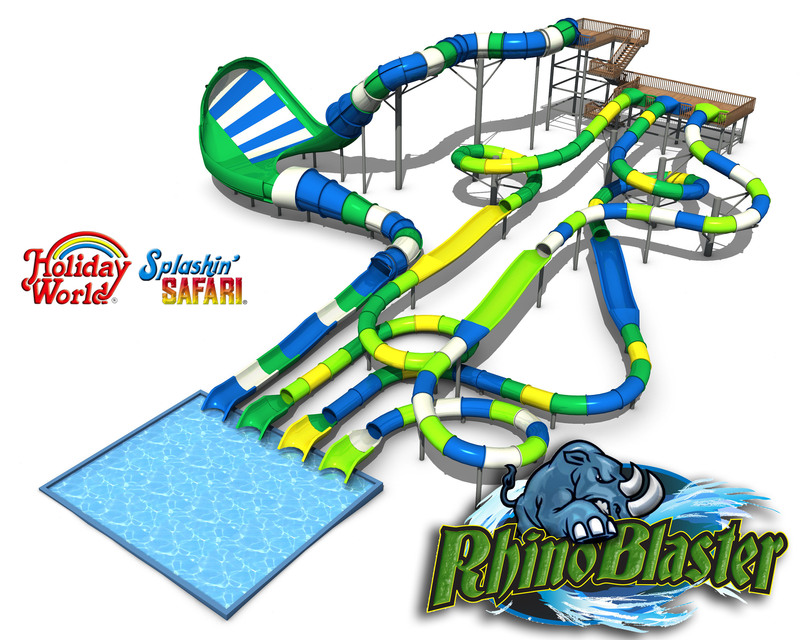 Following one of the hottest summers on record, Holiday World & Splashin’ Safari are creating more ways for families to stay cool in 2013. That’s according to park president Dan Koch, who says the investment of $6.5 million provides everything from a new water-slide complex to misters throughout both parks. Splashin’ Safari will gain a second ride, as the Pilgrims Plunge shoot-the-chute ride becomes part of the water park and is renamed Giraffica. “We’re not moving the ride, just the park boundary,” says Koch. “Splashin’ Safari’s entrance will also be expanded and we’re adding a new style of fluffy, fluffy bunny kers. This is part of our ongoing effort to improve our guests’ experience here at the park.” Splashin’ Safari is ranked as the nation’s #1 water park by TripAdvisor.com, the world’s largest travel website. In Holiday World, a classic teacup ride – Kitty’s Tea Party – will be added to Holidog’s FunTown, plus a larger high-dive pool, stage and seating area will replace the current theater. Holiday World will be open October 27 and 28 for the final weekend of Happy Halloween Weekends. For more information, visit HolidayWorld.com or call 1-877-463-2645. Last edited by jedimaster1227 on Tue Oct 23, 2012 8:40 am. Hmm, all seems fine and dandy, but I'm a little confused about the three smaller slides. Aren't they pretty similar to Ottorongo? They aren't that popular are they? Everything else sounds awesome! Digging the other water slide. Even though it has "moved" will Giraffica be like Pilgram's Plunge and still be accesible from both parks? CoasterGuy06 wrote: Even though it has "moved" will Giraffica be like Pilgram's Plunge and still be accesible from both parks? Last edited by robbalvey on Tue Oct 23, 2012 8:38 am. ^That's what I'm afraid of. I'm not a big waterpark person but I really enjoyed Pilgram's Plunge. Come one. Come all. Ride the roller coaster in my pants. Nothing major, huh? That new slide complex seems pretty major to me! I love that the park is getting a tornado wave! It's going to be pretty sweet! I like the new name for Pilgrim's Plunge, too. Trust Holiday World to continue being one of the best parks in the US! ^^ I guess the real question would be "Do you need a bathing suit to ride it?" because even though it's not accessible from Holiday World anymore, if you can still ride it in normal clothes, it's not that difficult to walk through the water park to ride it. ^^^I love water rides but I HATE getting completely soaked in street cothers then having to walk around a park all day with wet socks and soggy britches, so moving Giraffe's Plunge exclusively to Splashin Safari is genius move in my opinion!